SEO expert Malcolm Coles has helped to create Tweet Rewinder, a nifty idea to help you rewind Twitter, according to this post on his blog. The video below explains how this new mobile web app, now in private beta, allows you to catch up on the tweets sent by people you follow in real time. This could mean catching up on a news story, journalism conference or a TV show. Indeed one of the promoted uses is to follow a hashtag, such as #bbcnews, and replay the Twitter conversation while catching up with the programme on the BBC iPlayer, 4OD, or similar. Coles, who developed the app with Raak, details which parts of the service are free where users will require a subscription. There are also screenshots to provide a taster. There is also a write up on The Net Web. Rewinder from Adriaan Pelzer on Vimeo. This entry was posted in Handy tools and technology, Mobile, Social media and blogging and tagged hashtags, malcolm coles, tweet rewinder, Twitter on September 20, 2011 by Sarah Marshall. The Washington Post has sponsored a Twitter term to appear at the top of the Trending Topics today as it covers the US midterm elections, according to a report by Poynter Online. This use of Twitter, the first by a news organisation according to the report, can be seen at work on the social networking site, where a label reading ‘Promoted’ appears next to the top trending term #Election and the top tweet is marked as ‘Promoted by The Washington Post’. When users click on that topic, one of the Post’s tweets will appear above other tweets with the #Election hashtag — giving the Post prime real estate to promote its coverage and updates. By being the only news organization using Twitter this way, the Post could rise above the din of election-related conversation and draw more traffic to its website. This entry was posted in Editors' pick, Online Journalism and tagged hashtags, poynter, trending topics, Twitter, Washington Post on November 2, 2010 by Rachel Bartlett. This is an update on a post I wrote at the beginning of last year – Ten things every journalist should know in 2009. I still stand by all those points I made then so consider the following 10 to be an addendum. 1. How to monitor Twitter and other social media networks for breaking news or general conversations in your subject area using tools such as TweetDeck. Understand and use hashtags. 2. You are in control. Don’t become a slave to technology, make it your slave instead. You will need to develop strategies to cope with information overload – filter, filter, filter! 4. Your beat will be online and you will be the community builder. Creating communities and maintaining their attention will increasingly be down to the efforts of individual journalists; you may no longer be able to rely on your employer’s brand to attract reader loyalty in a fickle and rapidly changing online world (see 7). 5. Core journalistic skills are still crucial. You can acquire as many multimedia and programming skills as you want, but if you are unable to tell a story in an accurate and compelling way, no one will want to consume your content. 6. Journalism needs a business model. If you don’t understand business, especially the business you work for, then it’s time to wake up. The reality for most journalists is that they can no longer exist in a vacuum, as if what they do in their profession is somehow disconnected from the commercial enterprise that pays their wages (one side effect of journalists’ attempts to ‘professionalise’ themselves, according to Robert G Picard). That does not mean compromising journalistic integrity, or turning into solo entrepreneurs; rather it means gaining an understanding of the business they are in and playing a part in moving it forward. OK, you may not be an editor yet but that is no excuse, and it is probably easier to innovate while you are still working on the coalface without managerial responsibilities. Plus, in some cases, your editor may be part of the problem. 7. You are your own brand – brand yourself online! I’m not talking bylines here – you need to build yourself an online persona, one that earns you a reputation of trustworthiness and one that allows you to build fruitful relationships with your readers and contacts. You can no longer necessarily rely on having a good reputation by proxy of association with your employer’s brand. And your reputation is no longer fleeting, as good as your last big story – there is an entire archive of your content building online that anyone can potentially access. Obvious ways to do this: Twitter, Facebook, personal blogging, but you can also build a reputation by sharing what you are reading online using social bookmarking sites like Publish2 and delicious (see 3). 8. You need to collaborate! Mashable suggests seven ways news organisations could become more collaborative outside of their own organisations, but this could also mean working with other journalists in your own organisation on, for example, multimedia projects as MultimediaShooter suggests or hook up with other journalists from other publications as Adam Westbrook suggests to learn and share new ideas. 9. Stories do not have to end once they are published online. Don’t be afraid to revise and evolve a story or feature published online, but do it transparently – show the revisions. And don’t bury mistakes; the pressure to publish quickly can lead to mistakes but if you admit them honestly and openly you can only gain the respect of your readers. 10. Technology is unavoidable, but it is nothing to fear and anyone of any age can master the basics. If you do nothing else, set up a WordPress blog and experiment with different templates and plugins – I promise you will be amazed at what you can achieve and what you can learn in the process. Learn more practical advice on the future of journalism at our news:rewired event at City University in London on 14 January 2010. This entry was posted in Journalism, Online Journalism and tagged collaboration, del.icio.us, entrepreneurship, hashtags, Marc Reeves, Publish2, StumbleUpon, Tweetdeck, Twitter on January 4, 2010 by John Thompson. Gawker is encourage commenters and readers of its site to share news, links and tips using a new tagging system. Using a text form on the site, tagging a message with #tips for example will send it to a ‘tips’ page, where all similarly tagged submissions will be pulled together to create a stream. Individual hashtags for different sections of the site have been introduced as part of the new Gawker Open Forums, reports Nieman Journalism Lab. “[A]s the front pages of our sites become ever more professional, it’s even more important to allow anarchy to bubble up from below. The goal is to blur the line between our editors and commenter-contributors,” publisher Nick Denton told Nieman. Starred contributors – e.g. those members of Gawker’s commenting community that have been given a star rating by the site’s editors – will have their tagged submissions immediately fed to the aggregated pages. Other tagged contributions will need to be flagged up by these starred users. This entry was posted in Editors' pick, Social media and blogging and tagged gawker media, hashtags, Nick Denton, online communities on October 15, 2009 by Laura Oliver. Looking for news and information about news trend as big as the swine flue outbreak can be a daunting task – while the introduction of hashtags, for example, can make this easier online, how can readers and journalists filter the facts from the disinformation, asks Ryan Sholin. This entry was posted in Editors' pick, Online Journalism, Social media and blogging and tagged hashtags, Publish2, Ryan Sholin, swine flu on April 30, 2009 by Laura Oliver. There have been discussions previously on accuracy vs speed when it comes to breaking news on social media platforms such as Twitter (see the debate around the reporting of the Mumbai terror attacks), but Ethan Zuckerman’s recent blog post raised some interesting points relating to the recent Moldova protests. The #pman tag used to report the protests was also used to spread disinformation, says Zuckerman, who references Jon Pincus’ post on the hashtag as an open channel. “[I]n the same way that the #skittles tag, promoted by the company as a form of viral marketing ended up being used for NSFW posts, it’s hardly surprising that #pman would attrack trolls and disinformation,” writes Zuckerman. A commenter on Zuckerman’s blog tested this out during the protests by posting fake, hashtagged updates, and seeing if these were seized upon by the media. The ‘troll/experiment’ was quickly rumbled however. Zuckerman says he will be looking into whether Romanian speakers will challenge the information spread in English-language updates, as well as whether good or bad nuggets of information spread more quickly. This entry was posted in Social media and blogging and tagged Ethan Zuckerman, hashtags, Jon Pincus, Moldova, Moldova protests, Mumbai, participatory tools, social media platforms, Twitter, viral marketing on April 20, 2009 by Laura Oliver. Twitter is increasingly being used by journalists to make contacts and track news events, but the Twitter user-interface (UI) itself is pretty limited making it difficult to track conversations. Fortunately its open API structure and the ability to subscribe to various types of RSS feeds from Twitter means there are a number of ways to track a ‘buzz’ around an event or specific conversations. Hashtags are one way to identify conversations based around particular subjects or events. If you don’t already use them, you might have at least seen them being used by others in your network. Basically it’s a keyword that you use in your Twitter post to associate it with a group, topic, or event. For example, every Monday night there is debate on Twitter ‘hosted’ under the hashtag #journchat, aimed at public relations professionals and journalists. If you consider that an unholy mix, then there is a tag just for journalists #journ plus other, less popular, variants such as #mediachat and #journalism. Another common usage for hashtags is at events. For example, our senior reporter Laura Oliver recently attended the Oxford Media Convention and was one of several journalists Twittering using the hashtag #omc09 (Journalism.co.uk has a dedicated Twitter channel for live event coverage – @journalism_live). So if you want to monitor posts with those hashtags, one simple way is to create an RSS feed based on a keyword search of Twitter or, better still, Twemes. But there are also a number of other tools you can use to track conversations. TweetDeck – This desktop application (still in beta) enables you to split all the Tweets you receive into topic or group specific columns. The default columns can contain all tweets from your timeline, @replies directed to you and direct messages. You can also make up additional, live-updating columns using the ‘group’ (to create a sub-group of just your favourite Twitterers, for example), ‘search’ and ‘replies’ buttons. You can also filter each column to include or exclude items based on keywords or users. Unfortunately it does not support multiple Twitter accounts (otherwise I would definitely prefer it as my main Twitter client to Twhirl). Tweet Grid – This is a browser-based application that allows you to search for up to nine different topics, events, conversations, hashtags, phrases, people, groups, etc. As new tweets are created, they are automatically updated in the grid. One particularly neat feature is that it can automatically add hashtags if you Tweet directly from their web page. Monitter – A browser-based application that is very similar to Tweet Grid except it is prettier and you can search for Tweets made within a certain distance of a chosen location. A widget is available for your blog or website but you would need to know a little html to install it. Roomatic – A browser-based application that creates an output page of Tweets based on a keyword or hashtag. Unfortunately it does not seem to do much else but could be handy if you need to direct readers to a page containing live updates on a particular event or topic. 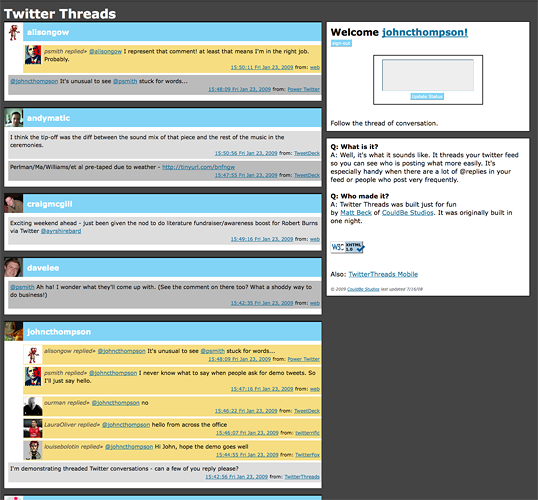 TwitterThreads – A browser-based application that threads your twitter feed, making it easier to follow conversations or connected Tweets. However, it does not seem to keep the threads together for long, or in quantity. 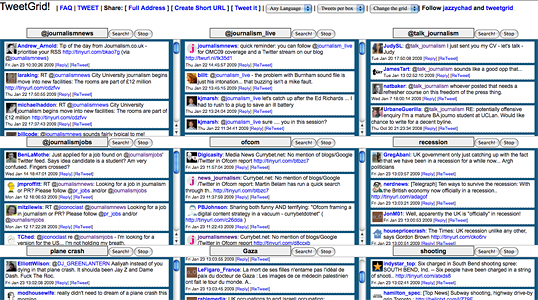 Tweetchat – A browser-based application that allows you to monitor and chat about one topic. You can tweet directly from the page and it will automatically add the hashtag of whatever ‘room’ you are in. The Twitter stream live updates. 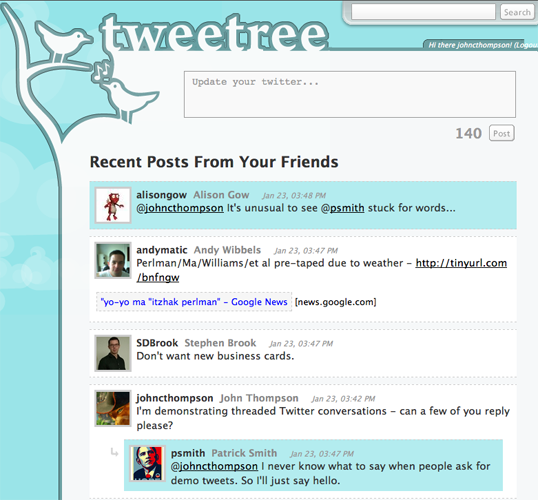 Tweetree – A browser-based application that puts your Twitter stream in a tree so you can see the posts people are replying to in context (but does not properly thread them). It also pulls in lots of external content like twitpic photos, youtube videos etc. Can you recommend any other tools? Let me know in the comments. This entry was posted in Handy tools and technology, Online Journalism, Social media and blogging and tagged API, hashtags, html, Journalism.co.uk, keyword search, Laura Oliver, Monniter, online conversations, public relations professionals, Roomatic, senior reporter, social media, Tweetchat, Tweetdeck, Tweetgrid, Tweetree, Twitter, Twitter channel, Twitter stream, TwitterThreads on January 23, 2009 by John Thompson. Follow this Twitter stream for the chat surrounding today’s Oxford Media Convention (refresh the page to see new Tweets). Keep an eye on our main site and on the blog for more OMC ’09 coverage. And don’t forget you can follow live, via @journalism_live on Twitter. This entry was posted in Events and tagged hashtags, Oxford Media Convention, Twitter, Twitter stream on January 22, 2009 by Laura Oliver.